A family of otters at Blue Planet Aquarium in Cheshire Oaks are enjoying their own version of trick or treat in the shape of carved pumpkins filled with fishy surprises. 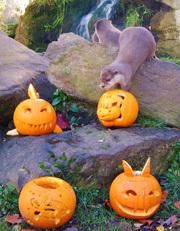 The pumpkins, which were carved by keepers and filled with a selection of tasty treats, have proved to be hugely popular with the aquarium’s Asian short clawed otters. Blue Planet Aquarium’s Tom Halton said: “Initially they were a bit non-plussed and we weren’t entirely sure how they would react. “However they are incredibly inquisitive animals and it didn’t take long for them to pluck up enough courage to go and investigate. “As soon as they spotted the fishy treats inside, there was no stopping them!” he added. The Asian short clawed otter is the smallest otter species, measuring under a metre in length. As their name suggests, they are found across southern Asia including India, China, Indonesia, Malaysia and the Philippines. Unlike most otters, their front feet are only partly webbed and have short claws used for digging under rocks and in the mud. These special adaptations make them particularly dexterous and you will often see them ‘juggling’ or playing with rocks and pebbles. They are highly social and intelligent mammals with a wide vocabulary. Scientists have identified up to 12 different calls. As they are such clever and inquisitive mammals, keepers have also provided them with a variety of objects, tasks and ‘play’ items as part of an ongoing environmental enrichment programme. These objects are regularly changed to ensure the otters are constantly having to learn and adapt to new situations – just as they would in the wild.